Arabian Nights is Net Entertainment’s progressive video slot, featuring wild symbols, free spins, and multipliers. To play Arabian Nights slot, players need to activate as many or as few of its 10 paylines. They can bet up to 10 coins per active payline, but there is no coin value range. They have to bet a minimum of $0.50. If they choose to bet max, they will have to place a bet of $50.00. Once they have placed their bets, players must hit the spin button to set the reels spinning. If a winning combination of symbols is displayed on the reels at the end of a spin, players will get paid according to the slot’s payout structure. Players can use the Skill Stop feature to stop the reels whenever they spot a winning combination. The Autoplay feature enables players to play the game automatically. Players can also customize their gambling experience by altering the game settings. The slot gives players a glimpse into the Arab world. If players enjoyed reading the Arabian Nights, they will definitely enjoy playing this slot. The reels feature icons of knives, tents, hats, camels, shoes, and high-value card symbols. The most special feature of Arabian Nights is its progressive jackpot; however, in order to win the progressive jackpot, players need to bet maximum. The player who lands five Arab symbols along an activated payline will win the progressive jackpot. The Arab not only helps players win the progressive jackpot, but also serves as the wild multiplier icon. It substitutes for all other symbols on the reels except scatters to help players complete winning combinations. If players take the Arab’s help to complete a winning combination, their payout for that combination will get doubled. If players fail to bet max before landing five Arab symbols along an activated ;payline, they will miss the progressive jackpot, but will win the top fixed jackpot of 10,000 coins. However, this prize will not be doubled before being credited to players’ accounts. The Oil Lamp symbol is the scatter, which means that scatter combinations pay irrespective of where they land on the reels. Players need to get at least two scatter symbols to win payouts. If they land two, three, four, or five scatter symbols anywhere on the reels, they will win scatter payouts of x2, x5, x20, or x500, respectively. The free spins bonus round gets activated if players land at least three scatter symbols anywhere on the reels. When this happens, players will get 15 free spins with tripled wins. Players can re-activate this feature while playing a free spin. 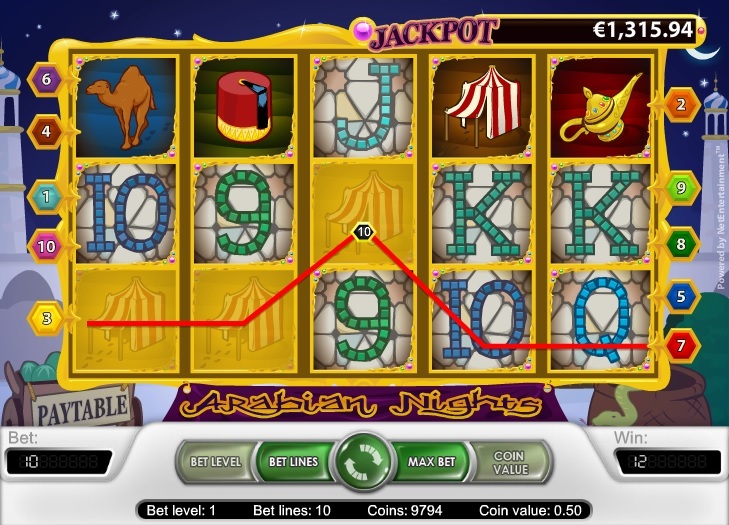 Arabian Nights is one of the most lucrative of NetEnt slots. Even if players miss the progressive jackpot, they can try winning the top fixed jackpot of 10,000 coins.